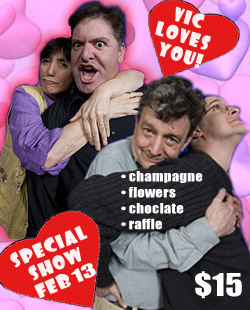 Valentine’s Show at the VIC! Home » Events » Valentine’s Show at the VIC! Bring your loved one, or just bring yourself — singles, couples, families, and all others are invited to our special show devoted to all aspects of love and the trials and tribulations that come with it. No other discounts apply. “Free ticket” coupons or vouchers may not be used for this event. Nearby street and lot parking is available and free after 6pm.